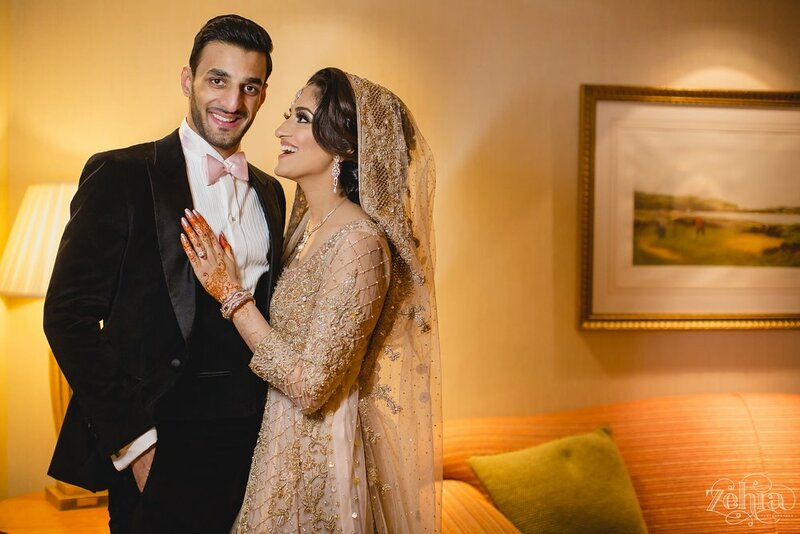 Having photographed Hira and Hashim's pre-wedding photoshoot as well as the Mehndi the week before, they were both very relaxed and confident in front of the camera. You'll see from the portraits that despite the chilly winter weather the newly-weds still had some fun! 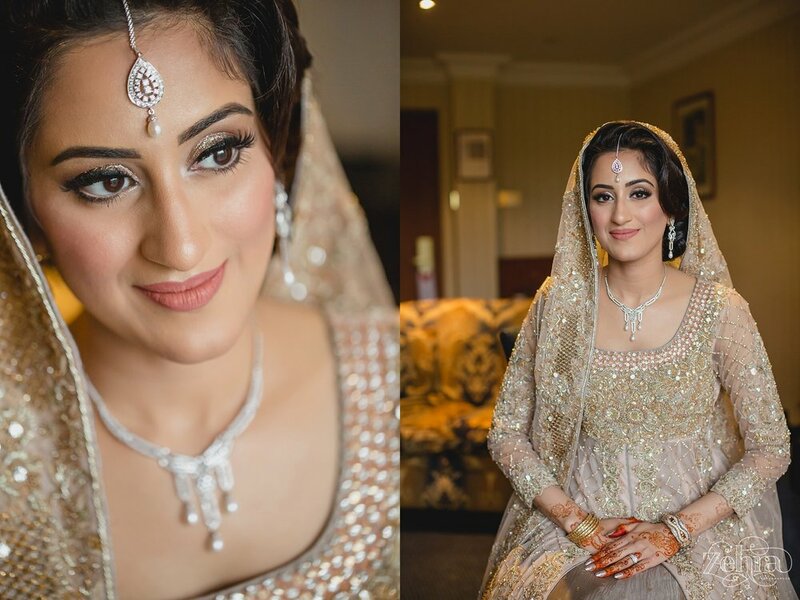 I had the opportunity to capture Hira's jaw-dropping accessories. 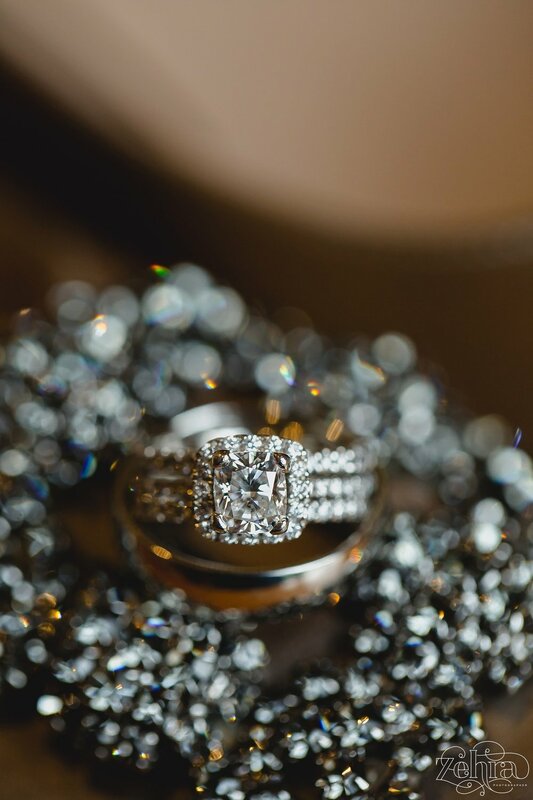 The rings and her delicate diamond jewellery set gifted to her by Hashim's parents were almost as photogenic as the couple. Hira's other accessories including the sparkly Jimmy Choo clutch and the beautiful warm grey, hand dyed Manolo Blahniks which had thankfully been received in time for the event after some postage drama. 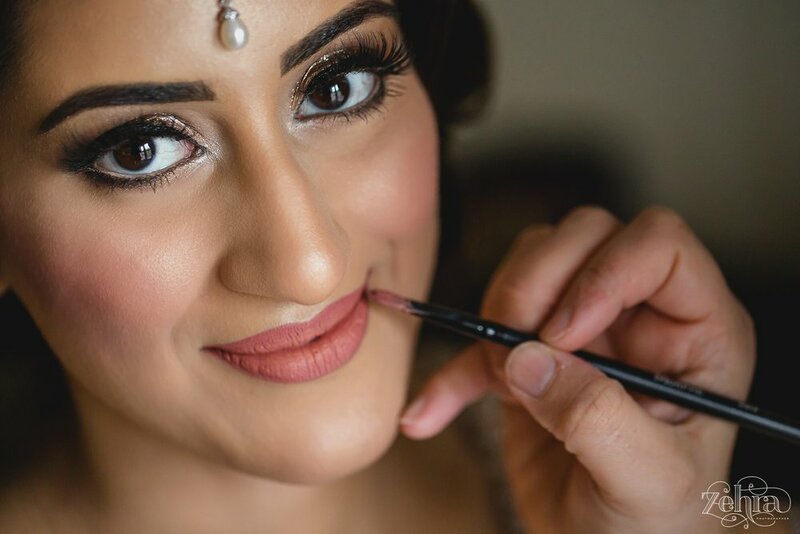 Just like her jewellery, Hira's hair and make-up had a wonderful elegant sparkle and she had an all day dewy skin with perfect glowy tones (a look created by Shamaela). 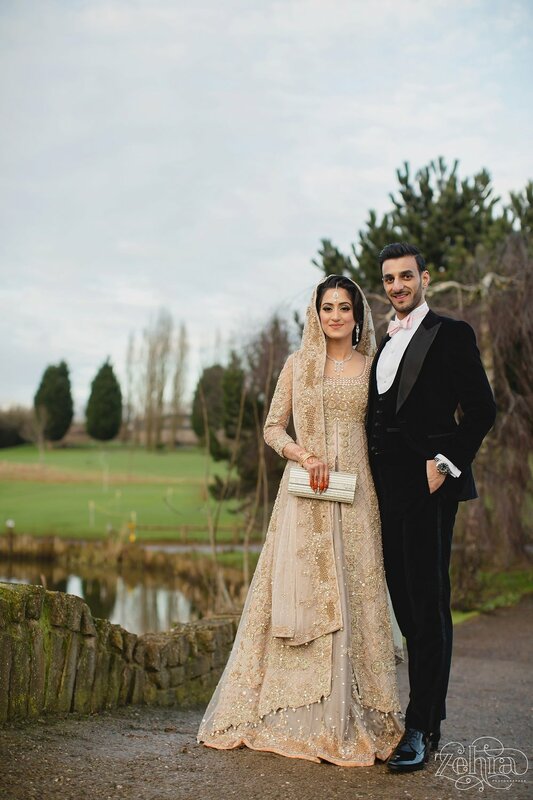 Hashim's accessories complemented his very suave (and warm) velvet tuxedo. 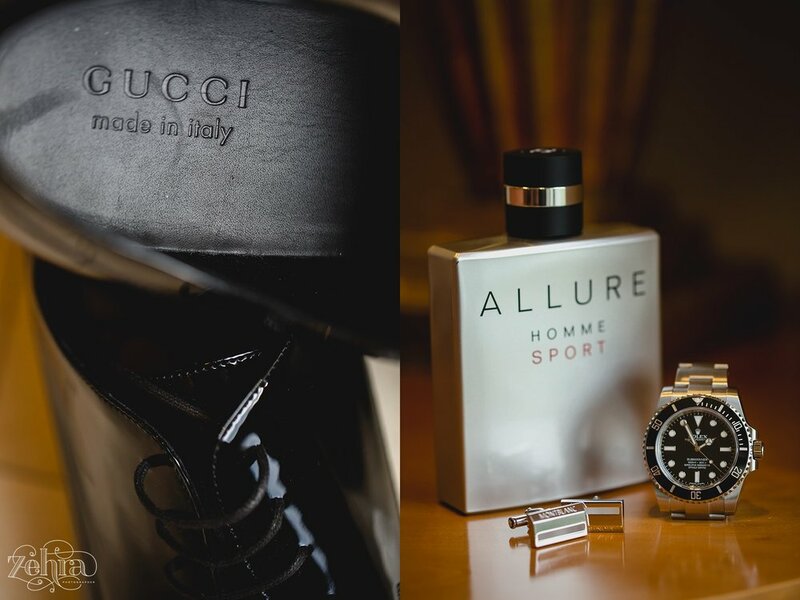 He had a glossy pair of jet black Gucci shoes, a timeless Rolex timepiece and a classy pair of Mont Blanc Cufflinks. Let's just say- this couple have great taste! We managed to get a lovely set of images in the wonderful outdoors, despite the chill. To warm up a little we went indoors to capture some portraits in the hotel lobby surrounded by yellow tones from all the lamps. As the grey wet day turned into a bright lit sunset, we managed to capture stunning colours with some very natural lighting. Once we arrived at the Motorcycle Museum, the golden tones continued with the stunning decor. 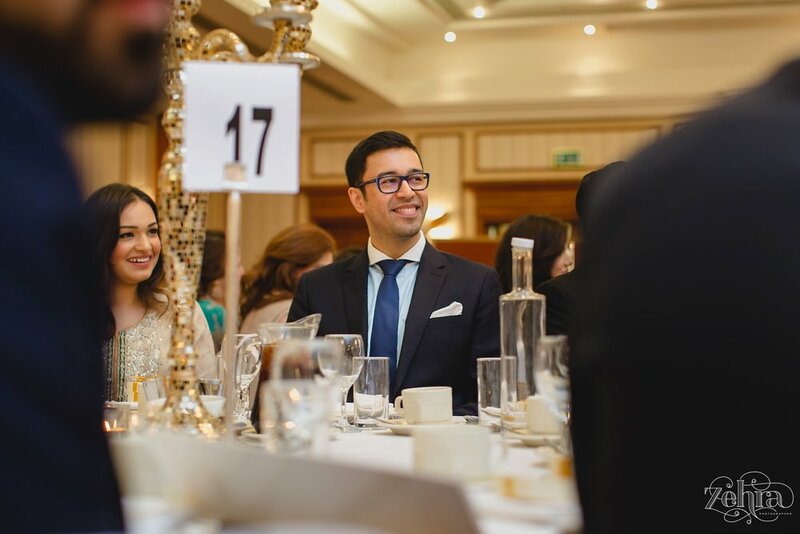 The decor consisted of white orchids and glass candle-lit baubles, as well as pearl and gold napkin rings and gold mosaic candelabras. 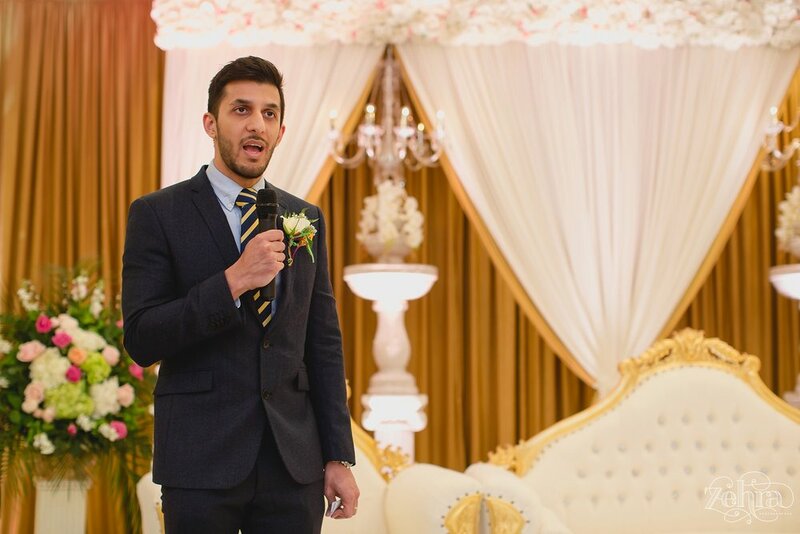 Apparant that Hashim is a super popular guy, it was lovely to see his close friends, Bart, Faizan and Adam say such lovely (and embarrassing) things about him. 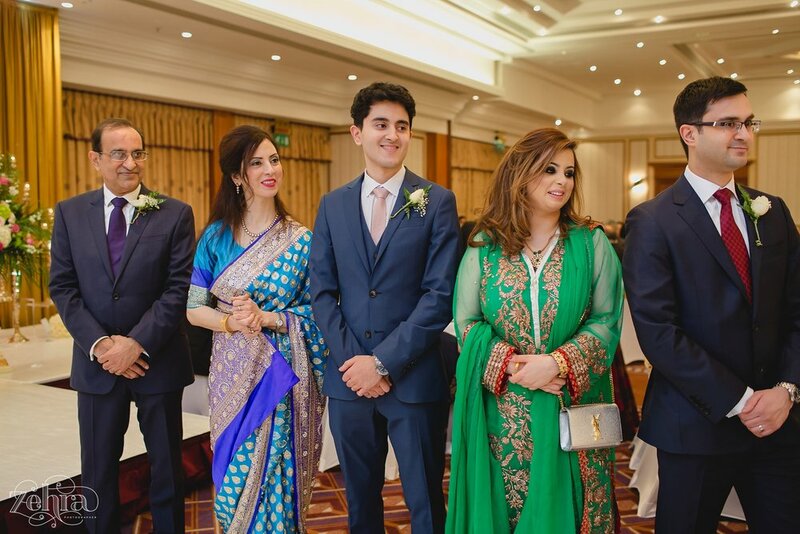 Notice how poor Hashim had his head in his hands at the Mehndi and the Walima too?! At every event, Hira's baby brother Raza got the ceremonial knuckle rub and pinched cheeks which was also fun to capture on camera! My sincerest thanks, to Hashim, Hira and their lovely families for looking after me. I am so blessed to have such lovely clients. The family were so hospitable, to the point where I was forced to sit down and eat. This time, I definitely wasn't going to resist- my fave caterer was in town! And to town they had gone! The menu consisted of melt in the mouth desi-style roast lamb and potatoes. If you haven't tried Sapna's food, it's about time you did! Here are some of my favourite images from the day. Leave a comment, let me know what you think!